Kevin: It is a house plant. I kill it. Our team is Canastasize! and the password is a single space. If you are participating (which you should, it will be awesome), please add yourself ASAP and specify your shirt size. On Saturday April 21th, the Canasta Club will be taking a trip to the San Francisco Twin Peaks! We'll be taking BART/Bus there and then hiking up the rest of the mountain. On the way back, we'll probably visit various other parts of SF, such as one of the BEST ice cream in the WORLD SF Swensen's Ice Cream and Hyde Street, depending on the time. If you are interested in joining us as well, please let us know!! Just sign up on the website (link at bottom for emails). - Money for food and souvenirs. 10am = Meet at BART on Shattuck. 10:15am = Take Milbrae train to Embarcadero. 11am = Take the M lightrail to Castro. Walk to Market/17th. 11:20am = Take Bus 37 to Crestline/Vista. 11:40am = Walk Crawl to the top. 12pm = Stare for 10 minutes. 12:15pm = Walk to Parkridge/Burnett. Take Bus 37 to Market/Castro, L lightrail back to Metro Montgomery. 12:50pm = Walk northwest to Sutter/Kearny. Take Bus 45 west to Union / Hyde. 1:15pm = Become one with ice cream. 2pm = Yay for 3 hours. 5pm = Walk south to Hyde/Pacific. Take bus 10 east to Sutter/Market, BART back to Berkeley. Jan. 27 First Official Meeting! Hello! Welcome to the UC Berkeley's Canasta Club's official website! Never played Canasta, or even heard of it? Don't worry! Most of us didn't have a clue what Canasta was when we joined, but we all learned together along the way . We're happy to teach anyone and everyone willing to learn, and even have a ladder system and semesterly tournament! Our club is dedicated to fun, fun, and more fun! That's right! We play board games, card games, dice games, video games, solve puzzles (the murder mystery type ones, or just any, actually), eat pineapples, go skiing, ask Haotian, play tennis, badminton, racket ball, watch movies, and, of course, play the one thing that brought us all together, Canasta! As you can see, we've expanded to do much more than just Canasta, and any new ideas for adventures are welcome! Check out our Everything page to get a small taste of what we do! Interested? We meet every Friday, 7pm-9pm in 187 Dwinelle, and this Friday, January 27th, is our first official meeting of the semester! There's absolutely no obligations, so swing by and check us out! Games played no longer give an automatic 5 points. All old games have been recalculated to reflect this. The results are surprising. Should make things a bit more competitive. Hello, hello! I hope that finals studying is going well for everyone! Canasta Club will be having a reunion tomorrow (Dec. 9) at 7:30pm!! We're planning on just having a quick get together dinner with everyone, so we can all go back to "studying" ASAP. We'll be meeting up in Durant Food Court (some people call this place Asian Ghetto), at Sushi House! So get your food from where ever, and meet us at Sushi House! Looking forward to seeing everyone for the last time (maybe) before break! And if we don't see you there, good luck on finals and have fun over break!! And so it's another year over. Come join Canasta Club for its semesterly end-of-semester tournament awards followed by a mix of fun holiday activities to celebrate the holidays! For the club half of the day, we'll also be throwing together a White Elephant gift exchange just for fun. Just bring a wrapped gift (make it either nice or funny) with no name written on it. We'll throw all the gifts in one pile and take turns either unwrapping a new gift or stealing from another member. Those of you who haven't been around for a while - it'd be a nice surprise for you to drop by! This last meeting of the semester, as usual, will be held *initially* in 88 Dwinelle at 7pm, Friday Dec.2. We'll spend about the first hour there, but afterwards, who knows where we'll be! @DeCal: For those still missing points and want to raise their grade, any additional games played this day will count towards extra credit. There's a 3-day weekend coming up on Nov.11. I doubt anyone is free Thanksgiving with family and all, so we should go on Veteran's Day instead (unless you do something special that day ). It'll be at Boreal (www.borealski.com) as usual. Your first time will cost $70 but includes rentals and lessons as well. Then the 2nd and 3rd time you go will only cost $30 for the same deal (and more advanced lessons). We'll leave early at 7am and head home about 5pm; bring food if you don't want to buy. If you or your parent can drive, please ask. It's a regular highway with multiple lanes - no narrow roads, not too far into the winter so you shouldn't need chains. 6am = Be ready to be picked up. Leave Berkeley. 8am = Arrive in Sacramento, leave for Boreal. 10am = Arrive at Boreal. 5pm = Leave Boreal to head home. 6pm = Dinner in Sacramento. 7pm = Leave Sacramento for Berkeley. 9pm = Back in Berkeley. Bringing back some of the summer time activities here... On Sunday Oct.30, we'll be meeting up for tennis in the evening, followed by dinner and a movie later that night. 6pm = Tennis, Hearst Courts. 7pm = Dinner from Asian Ghetto, movie at 2525 Durant Ave. There are a few movies we can select from. They'll be in a similar genre to "Donnie Darko". If you want to join us, let us know by signing up for the event or replying back. Canasta Club is going to Six Flags for Halloween on Oct.16! They have RIDES, AMINALS, and HAUNTED HOUSES TENTS. If we can get 15 people it's only $26 per person, otherwise it's $40 per person; bring an additional $10 or so if you're taking the bus with us. If you are interested in joining us as well, please let us know!! Just sign up on the website, link at bottom of email. - Shoes that don't fly off. 10:00am: Get to Six Flags - Yay! 12:00pm: Lunch at back of park (food court). 7:30/9:30pm: Walk to Bus 85, ..yadayada.. Berkeley. 8:30/11:30pm: Get home and bah. Oct.2 Ice Skating and Bowling! The Canasta Club will be going ice skating and bowling at the Yerba Buena Ice Skating and Bowling Center on Sunday, October 2nd. Admission is $11 including skate rental. Bowling is $35/lane/hour. Bowling shoe rental is $4. Officially we will be going to both, but you just can leave, for example, after ice skating if you want. 2:15pm: Meet at 2525 Durant Ave. Walk to BART. 8:00pm: BART back toward Richmond. Hello everyone and welcome to the first semester of the Canasta DeCal! Just a reminder the first day of class will be this Friday, September 9, at 7pm in 88 Dwinelle. You are not required to bring anything but yourselves as we'll be providing the cards and everything else you'll be needing to play. We'll be going over administrative details, such as what we'll be doing this semester, what to expect, what it takes to fail this course... After that we'll jump straight into teaching everyone the basics of the game and letting you learn the game hands on. Important Administrative Announcement: This course is only 1 unit. The berkeley site is slow to update this, but if you cannot/don't want to take this as a result, please drop immediately. Still absolutely come! Everyone gets to play regardless if they are in the DeCal or not, all the games will be here, the club is still here. If you don't know how to play Canasta, as usual, we will teach you! The only difference now is that the first couple hours will be strictly Canasta. After that... the usual. P.S. For questions, comments, or concerns, feel free to go ahead and reply to this thread. You should all have an account and be able to reply or start discussions via email or website, just like with GoogleGroups. Once upon a summer time, we went to the best ice cream in the world SF. Then next week we tried to go to the other best ice cream but missed the bus. Now that school has started, we shall try again (and this time not let Perlin solely plan it ). To quote Perlin: "Hello, hello, everyone! I hope summer fall is going swell for you guys, and in lieu of our huge ice cream adventure success last last, last, last, last, last, last, last, last, last, last, last, last, last, last, last, last Friday (Friday, Friday), we will be having another one tomorrow, July 8th Sept. 4th at 5pm! This time we won't be heading far from Berkeley, because also on the list of Best Ice Cream places is none other than Fenton's! " 5PM = Meet in front of South-side asian ghetto or 2525 Durant. 5PM-6PM = Take bus 1 south to 55th/Telegraph, then bus 12 south to Piedmont/Glenwood. 2 fails permitted. 6PM-7PM = Yay for 1 hour. 0 fails permitted. 7PM-8PM = Take bus 12 north to 55th/Telegraph, bus 1 back to Berkeley. 2 fails permitted. For the longest time, there was probably little-to-no evidence that we ever did anything other than play Canasta. Our pictures were few. Our event descriptions say to meet somewhere, but we often only stayed a couple hours before spending another 5 hours elsewhere (Crossroads). We randomly take off and members who happen to be out for a few minutes get left behind (Shin). Some members don't even make it out of their apartments before we're already on our way back to Berkeley (Perlin). But what have we actually done so far? Our activities have ranged from randomly heading out to a show or movie, playing Bomberman with 10 people, traveling up to the Botanical Gardens in the rain, getting lost on the way to Six Flags, eating the best ice cream in the WORLD SF, playing tennis every Friday, celebrating birthdays, watching fireworks, debating about life, ... I bet at least less than most of you will probably not have realized one or more of these activities that we have done ever occured. So now, to compensate and make sure everyone that wants to know knows what's going on, we now have the new EVERYTHING section on the website! After one hour, I've managed to put together somewhat of a wiki/blog/mailinglist hybrid with various activities to participate in. Just check up regularly on an activity if you're interested or use the Subscribe feature to receive/reply to emails instead. If you're interested in tennis, head over right over to the Tennis section; we play every Friday. If you want to know what movies we might be watching soon (though we rarely know ourselves), head right over to our Movie Nights section. If you're dying to know the meaning of life, go Ask Haotian. If you have ideas for other discussions or activities, you can also suggest a new section and we'll set it up. This is just a taste of what's to come. More sections will be added soon. Perlin, for example, is planning a book club section (but she's in Malaysia so that might be "eventually" rather than "soon"). Hope you guys will find it useful. As always, suggestions and feedback are welcome. The Canasta DeCal is Official! Beginning Fall 2011, the Canasta Club will be hosting its first ever and only first ever forever ever first Canasta DeCal course for the first time ever! After chasing after professors to sponsor us for more than 34 weeks, 28 days, 6 hours, 42 minutes, and 12 seconds, the DeCal is finally official! 7:00PM Get food. Click for an artist's impression of this scenario. Hello, hello, everyone! I hope summer is going swell for you guys, and in lieu of our huge ice cream adventure success last Friday (Friday, Friday), we will be having another one tomorrow, July 8th! This time we won't be heading far from Berkeley, because also on the list of Best Ice Cream places is none other than Fenton's! 7PM - Transit, Dinner, and ice cream at Fenton's! 8:00PM - Arrive and omnomnom! Yay! I hope this isn't too last minute, and see everyone tomorrow! Celebrate the 4th of July with the Canasta Club! We will be heading to the SF bay for dinner and activities followed by the fireworks showing over at Pier 39. 6:00PM = Meet at 2525 Durant Ave. Head to BART. 7:00PM = Get off at Embarcadero. Yay for 2 hours. 9:00PM = Fireworks begin over the bay! 10:00PM = Crawl back to Berkeley. Let us know if you're going - or surprise us the day of! Hey everyone! I hope finals studying (or whatever else you've been busy with) has been going well! Since we've all been working so hard (or not), a little break is in order! So today, May 6th (seis de Mayo), we're having a canasta reunion at Crossroads for late night!! William has kindly volunteered to swipe everyone in, so come on out to our final get together before the school year ends! We'll be meeting outside Crossroads at 9:50pm sharp and heading in together, so don't be late! Questions, comments, concerns? Just shoot back a reply or call/text. It's Canasta Club's last official meeting of the semester, and possibly the last club meeting ever because it's going to be a decal next year! So it's going to be a very special meeting with snacks and games. This may not sound different from an other meeting, but it is... because it's bring your own game day! I'll be bringing Apples to Apples and if anyone else has any good games, bring them! It's the same room as always, 136 Barrows, from 7pm until sometime very late at night/early in the morning! So as Perlin's roommate Whitney kindly pointed out, there's a cool Cherry Blossom Festival in San Francisco this week and next week. Obviously since today passed, and tomorrow is too soon, we're going to go next week. Because of Calday on 4/16, we're going to go there on 4/17. If you look at the Canasta Club website now, you will find a new tab called 'Find Games'. The new Game Finder feature will let you create and join game requests (meeting times). This makes it much easier to meet up or play Canasta outside of the weekly club meetings. Rather than wonder hopelessly who else might happen to be free, or call everyone and risk spamming people, you can just create a game and be notified when someone joins it. 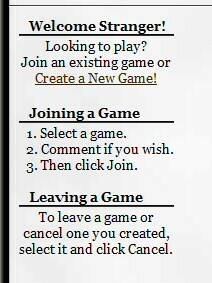 Those who want to play would simply check this page to see who else is available. If no game is currently up or you cannot make any of those times, you can just start a new request. You will receive emails everytime someone joins or leaves your game, so you do not have to worry about constantly checking the page or forgetting you had a game up there to begin with. Once a game is filled, people can continue to join but end up waitlisted. They move up automatically if slots open up, so even then, there is virtually no work on your part. Any questions, just let me know. Feel free to test it out and see how things go. Hopefully this will come in handy for setting up times outside of Friday evenings. For example, there are a few of you who have asked to play on Yahoo Games (auto shuffling/dealing/scoring) but have no idea who else would be free; this should make it easier to organize such a meetup. Today is the tournament! If you haven't signed up yet, please do so now. The entry fee is $15 and can be paid at the door. Hope to see everyone there and may the best player win--I lost [the game]. Anyway, be at the tournament, room 136 Barrows, 7:00. On Saturday April 2nd, the Canasta Club will be taking a trip to Six Flags Marine World Africa USA Discovery Kingdom! We'll be taking BART/Bus there and then getting a group discount for the tickets, so the total per person will be $40. 8:30am: Take BART, then Bus 80, 2, and walk. 6:30pm: Walk to Bus 2, ..yadayada.. Berkeley. 8:30pm: Get home and bah. Anyways, I hope to see most of you there. Even if you don't like rides, there are AMINALS, and if you don't like them either, there are GO KARTS and GAMES. Lots of fun stuff - don't miss out. Hey everyone, I bet you guys are really sad to have missed the Lawrence Hall of Science/Botanical Garden trip, so to make up for that, we're having another field trip! This Friday, March 11th, instead of meeting up and playing Canasta, we're going to take a field trip to see Theatre Rice perform! Unless you guys don't want to, that is. Reply to this email/sign up to let us know if you want to go so we can buy presale tickets! Presale is $5 and it's $7 at the door. If not enough people show interest, we can always just fall back on meeting up like a regular Friday. We also have the rest of the night after the show to play Canasta/watch movies/go to Crossroads, but it's all up to you guys! So please reply/sign up asap! The Canasta Club will be taking a trip up to the Lawrence Hall of Science and the UC Botanical Gardens this Sunday, March 6. The two attractions are near each other, have a great view of Cal+ ocean + SF, and most importantly... are both FREE. We will meet initially at 10am on Euclid and Hearst Ave (northside, next to North Gate, across from Asian Ghetto). Because the H line from Evans does not run on weekends, we will be taking a rather much more convoluted route to get there - via the 65 line! No worries though - this means we get to pass through the Rose Garden on Northside as well - more views and scenery. After the Laurence Hall of Sciences, it is only a 10 minute walk down to the Botanical Gardens whenever we decide to go. Remember to bring cameras and good shoes and enough clothes to keep you warm incase we decide to stay until the sun begins to set.